I was given a copy of the Make it Easy Cookbook by Jane Lovett to review and this Prawn and smoked salmon terrine immediately jumped out as an ideal starter for Christmas Day. It can be made up to 2 days in advance, so on Christmas Day you can just take it out of the fridge slice it up and serve with a small salad. Perfect for a stress free Christmas Day starter. 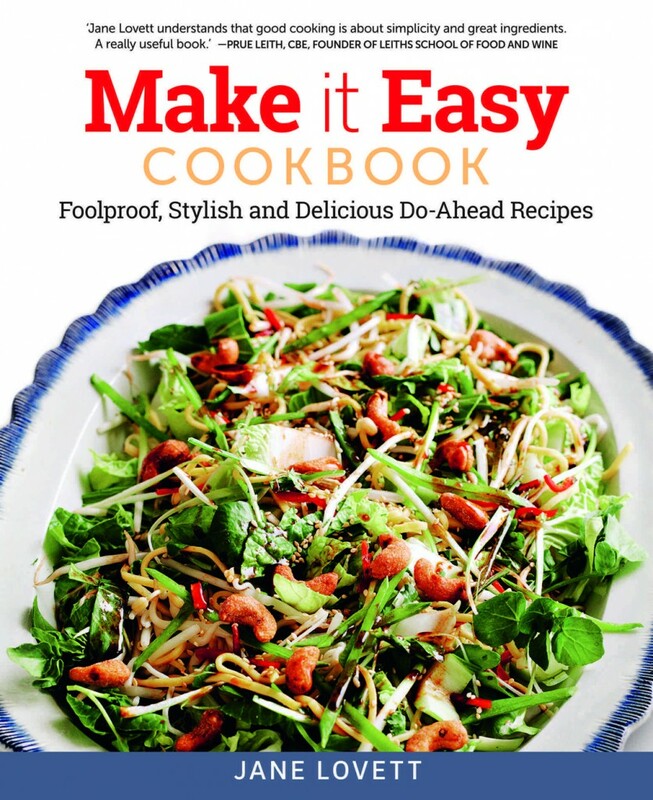 Jane’s cookbook is full of simple dishes that you can get ahead on, so there’s minimum work on the day. Cook the onions in the butter gently until soft but not coloured. Allow to cool. Wet the inside of a 1.2 litre (2 pint) terrine or loaf tin and line with clingfilm, then slightly overlapping slices of smoked salmon, leaving a little hanging over the sides to fold back over the top when filled. Finely chop the rest of the smoked salmon. In a large bowl beat together the mascarpone and onions. Stir in the lemon juice, chives, chopped smoked salmon, Tabasco, salt and pepper. Drain the prawns on paper towel and then squeeze gently in your hands to extract the excess moisture but not to dry them out completely. Chop briefly in a food processor or by hand. Don’t over-do it, they should still be chunky and have some texture. Mix into the rest of the ingredients. Check the seasoning. You may like to add some more Tabasco. Finally, stir in the ‘caviar’, if using, and spoon into the prepared terrine, pressing down as you go. Fold the overlapping smoked salmon over the top, cover and chill overnight. To serve, turn out, remove the clingfilm and slice straight from the fridge. 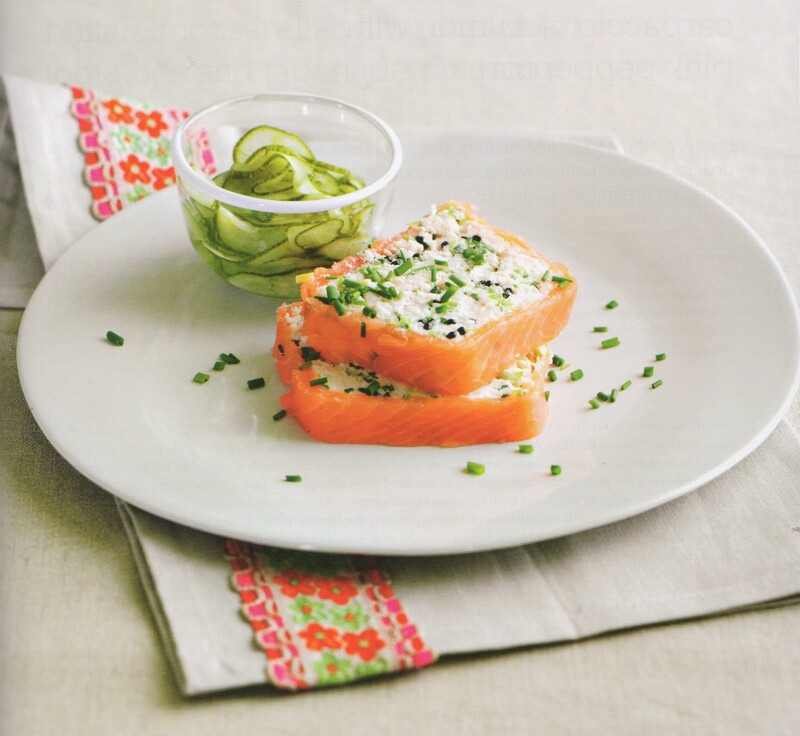 Decorate with chopped chives or watercress and serve with pickled cucumber. GET AHEAD TIP: Make up to 2 days ahead and refrigerate. HINTS AND TIPS Avruga or Onuga Caviar is in fact herring roe and quite delicious. Stored in the fridge, it has a long shelf life so it is very useful to have a jar ‘in stock’ for decorating canapés or starters. It is impossible to buy fresh, cooked, peeled prawns. The ones you see in the shops have been frozen and thawed out, for which the shops charge a lot extra, so it is cheaper to buy them frozen and thaw at home.